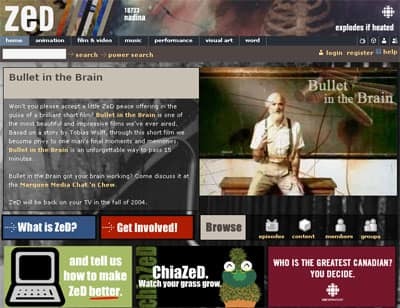 The Vancouver-based convergent TV/internet initiative known as ï¿½ZeD beta v0.1ï¿½ makes a soft launch at zed.cbc.ca and on late night television. The project, billed as ï¿½CBC Televisionï¿½s launch pad for creative expression,ï¿½ is an eclectic mix of new artists, short films and public input, which helps shape the show. More than 50,000 creative uploads are eventually submitted before the showï¿½s cancellation in 2006. Toronto Star media critic Antonia Zerbisias praises the program as revolutionary and risk-taking, arguing that ZeD represents, "things public broadcasting should be about: non-commercial innovation and experimentation, interaction with the audience and contributions from young filmmakers."